Adam Le Fondre earned Cardiff their first league win away from home this season with the only goal at Watford. The hosts started brightly and saw Daniel Toszer denied by David Marshall before Troy Deeney had the rebound cleared off the line by John Brayford. Le Fondre was more clinical, tapping in from close range after Kenwyne Jones's headed effort came back off the post. Marshall made a series of fine saves either side of the break, while Watford's Gianni Munari hit the post. Victory moves the Bluebirds up to eighth in the table, equal on points with Watford in seventh spot and two points outside the play-offs. After Marshall failed to hold a powerful Tozser shot, Brayford did enough to block Deeney's goalbound effort after the 26-year-old latched onto the loose ball. Scotand goalkeeper Marshall then did well to foil Hornets top-scorer Matej Vydra in a one-on-one soon after. Then some sloppy play allowed Anthony Pilkington to find Jones for the header that led to the winning goal. Czech Republic striker Vydra continued to look the most likely source of an equaliser, but he found the ball stuck under his feet with only Marshall to beat before a fine challenge from Matthew Connolly prevented him having a clear strike on goal after being released by Deeney. Le Fondre then pounced on Juan Carlos Paredes' poor control in the box, but Watford keeper Heurelho Gomes was equal to the threat. Marshall ensured victory with fine saves to keep Munari and Almen Abdi out before Munari steered the ball onto the post after Vydra drilled in a cross. "They created chances - they'll create chances against everybody in this league - but we were resolute and we kept persevering in the second half. "We were trying to remain a threat as well on the counter-attack, but it was a really, really solid performance. "We couldn't have delivered that three or four weeks ago, that's for sure, but we're coming together now, the group's coming together, working hard for each other. "I saw some really good qualities out there today." "We are disappointed after this game. It's very difficult to make some explanation for what happened today. "That is four times for us and we are not in an easy situation about many things. "We had a problem with long balls, especially with Kenwyne Jones in the first half, but we fixed this problem. "I understand many people are disappointed. We must apologise for this bad result, but we have to continue working and try to find a solution." Match ends, Watford 0, Cardiff City 1. Second Half ends, Watford 0, Cardiff City 1. 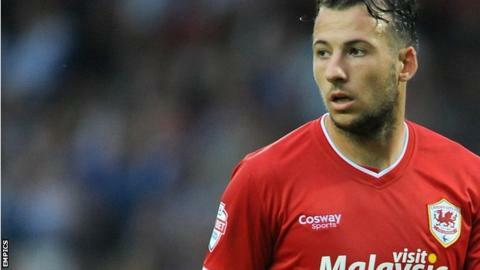 Adam Le Fondre (Cardiff City) wins a free kick on the left wing. Attempt missed. Sebastien Bassong (Watford) left footed shot from the centre of the box is close, but misses to the right. Assisted by Fernando Forestieri with a cross. Corner, Cardiff City. Conceded by Ikechi Anya. Ikechi Anya (Watford) wins a free kick in the attacking half. Foul by Peter Whittingham (Cardiff City). Attempt missed. Daniel Tözsér (Watford) right footed shot from outside the box is close, but misses the top right corner. Assisted by Matej Vydra. Attempt missed. Fernando Forestieri (Watford) left footed shot from more than 40 yards on the right wing is close, but misses to the left. Assisted by Matej Vydra. Attempt missed. Fernando Forestieri (Watford) header from the right side of the box is close, but misses to the right. Assisted by Ikechi Anya with a cross. Attempt blocked. Joe Ralls (Cardiff City) left footed shot from the left side of the box is blocked. Assisted by Kenwyne Jones. Kenwyne Jones (Cardiff City) wins a free kick on the left wing. Attempt missed. Daniel Tözsér (Watford) left footed shot from outside the box is close, but misses the top left corner. Assisted by Gabriele Angella. Attempt blocked. Kenwyne Jones (Cardiff City) right footed shot from the right side of the box is blocked. Assisted by Adam Le Fondre. Offside, Watford. Fernando Forestieri tries a through ball, but Matej Vydra is caught offside. Attempt missed. Gabriele Angella (Watford) right footed shot from outside the box is close, but misses to the right. Substitution, Cardiff City. Tom Adeyemi replaces Aron Gunnarsson. Attempt missed. Craig Noone (Cardiff City) left footed shot from outside the box misses to the right. Adam Le Fondre (Cardiff City) is shown the yellow card. Substitution, Cardiff City. Joe Ralls replaces Anthony Pilkington because of an injury. Delay in match Anthony Pilkington (Cardiff City) because of an injury. Corner, Cardiff City. Conceded by Heurelho Gomes. Attempt saved. Anthony Pilkington (Cardiff City) right footed shot from outside the box is saved in the top right corner. Assisted by Kenwyne Jones. Foul by Sebastien Bassong (Watford). Fernando Forestieri (Watford) wins a free kick on the left wing. Substitution, Watford. Fernando Forestieri replaces Juan Carlos Paredes. Substitution, Watford. Adlène Guédioura replaces Almen Abdi. Corner, Cardiff City. Conceded by Sebastien Bassong.